There is a touch of divinity everywhere in Himachal, and therefore an old proverb says, “blessed are those who wonder in the wild valleys, for they shall see nature, and through her, god”. 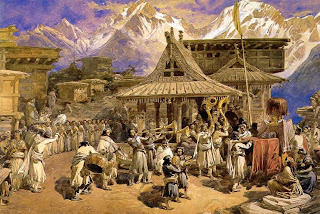 The people of Himachal though subject to almost every empire that ever ruled the North Indian plains, managed to sustain an unbroken tradition of ritual and sacred arts. 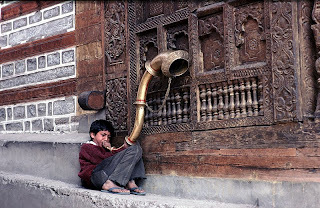 Himachal is inhabited by various tribes though there are very little evidences of their history. 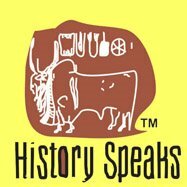 The tribes were ruled by local chiefs, Ranas and Thakurs in different eras of its 2000-year-old unbroken history. With the formation of dynasties such as the Katoch of the Kangra Valley, the Bushahra of Shimla and Kinnaur and the Vamanas of Chamba, Himachal enjoyed long periods of uninterrupted rule in which these empires built cities and forts, and nurtured strong artistic tradition. Unlike empires in the plains, the rulers of Himachal were rarely threatened by dissolution of outside forces. However they paid tribute to the rulers of the plain, beginning with the Kushanas in the second century AD, the Guptas, and later the Mughals, Ranjit Singh of Punjab and finally the British. 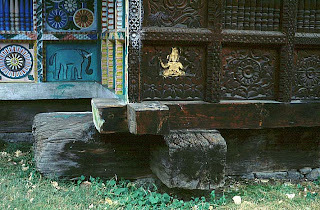 The influence of their artistic tradition had also made strong impact in the Himachali heritage, bringing a fusion of the local and alien arts, found especially in the Pahari paintings of Kangra and the British bungalows and chapels. 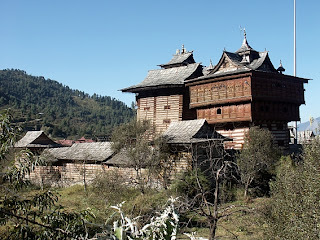 Great temples were built in different styles and material throughout Himachal through peaceful avocation of its people. 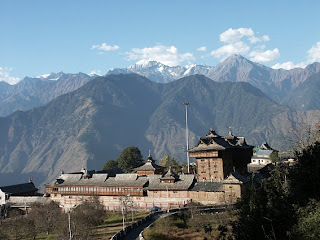 The temples of Himachal vary across regions, namely Kinnaur, Kulu, Chamba and Kangra. 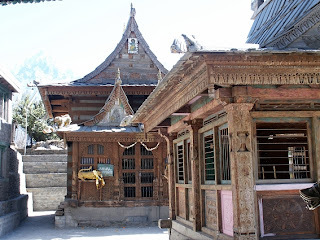 The speciality of Himachali temples, especially in Kinnaur is the extensive use of wood and stone. In India, the temples of the formative period, which was prior to the rule of Mauryas in the 3rd century BC, had been built using timbers, though very little of these have survived to these days. Timber was replaced with stone from the Mauryan period onwards and buildings in stone found increasingly sophisticated during the rule of the Guptas. By the 8th century AD, the basic pattern of temple construction was formalised. It is also this era that Himachal’s oldest surviving stone temple, Gauri Shanka in Jagat Sukha in Kulu district was built. 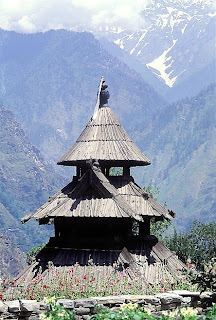 But the region’s spectacular treasures are its equally ancient wooden shrines, such as Lakshana Devi and Shakti Devi in Chamba, and Mrikula Devi in Lahul Spiti. The stone – wood combination in temple building was preferred due to the local climatic and seismic condition. The style is known as Kath Kuni, a method of alternating stone with wood to guard against the earthquake. 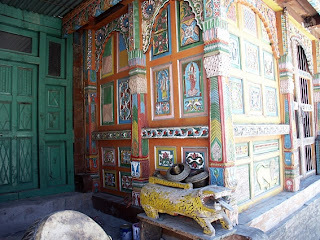 Similar construction patterns are also found in the secular architecture of Himachal. 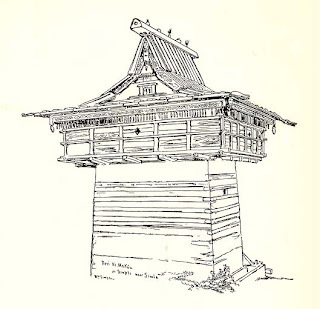 For temples, however the alliance was not just physical – once the wooden detail had become part of the stone tradition, they were never completely abandoned. The classical traits gradually found their ways into the folk and [they]…frequently intermingled….with each other. Kinnaur suurounded by Tibbet in the east is a beautiful district having the three high mountain ranges, Zanskar, Greater Himalayas and Dhauladhar, enclosing valleys of Sutlej, Spiti, Baspa and their tributaries. The slopes are covered with thick wood, orchards, fields and picturesque hamlets. People are honest and believers of both Buddhism and Hinduism. 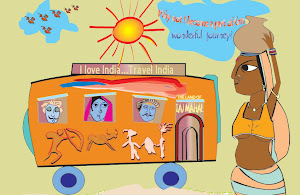 They believe that Pandavas came and resided in their land while in the exile. 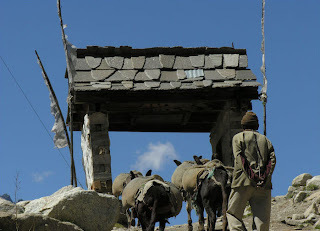 In the ancient mythology the people of Kinnaur were known as Kinnaras, the halfway between gods and humans. In 647 AD, after the death of the Emperor Harshavardhan (Kinnaur was part of his kingdom) the entire northern India was divided into numerous principalities. According to historians, princes of some of these principalities explored the steep mountains in adventurous trails and occupied at Kinnaur. During their rule, the Kinnauries lived in perfect peace and in complete isolation from the events of the plains…or from upheavals of Tibet, Ladakh and Kashmir. 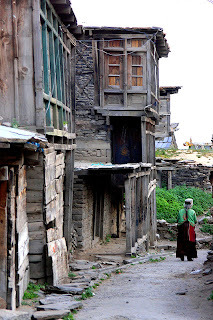 Traditionally, Kinnaur’s history has been preserved by generation of Gorkchs – local oracles who recite historical narratives called chironigns during celebrations. 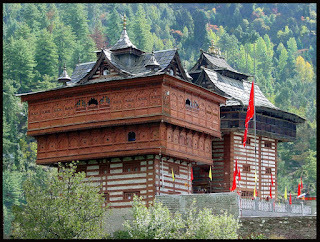 Bhimkali temple at Sarahan, the Bushahra capital is the most splendid among the temples of Kinnaur. Located at a height of 2, 150 meter, the charming village of Sarahan was once the capital of Bushahras. The origin of the temple is steeped in many myths and legends. One talks of Lord Shiva, disguised as Kirata, inhabiting this place that was then known as Shonitpur. After his defeat in battle with Lord Krishna his head was buried where the temples entrance has been built. After Banasur, Pradumna, the son of Lord Krishna became the ruler of the Kingdom. The Bushahra dynasty that was to rule uninterruptedly from Srahan traces its ancestry to this mythical king. 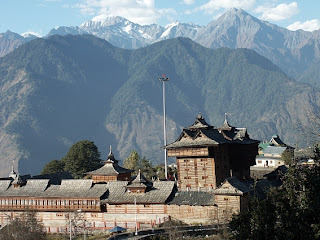 The Bushahras constructed this magnificent temple for Bhimkali, the presiding deity of their family, in what was originally their palace complex. 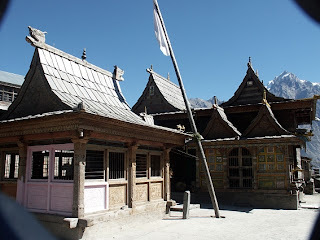 Another legend tells us that how the sage Bhimgiri on his way back from a pilgrimage to Kailash, carried a wooden stick, which he worshipped as the form of the Devi. At Sarahan, he found the stick had grown so heavy he could not move it and realised that Devi wished to reside here. But the land was full of demons, and it was only after the Devi had subjugated them in battle, in which she assumed the form of the powerful Bhima, that her temple was established here. The sacred compound measures approximately one acre and includes both the old and new Bhimkali temples, separate shrines to Narasingha, Raghunatah and Patal Bhairav or Lanka Bira as well as the old Bushahra palace. The old temple, built at least 800 years ago, has been described as ‘one of the finest specimens of hill architecture’. 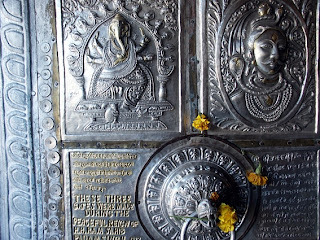 The old temple now function as a store house and is best known for the exquisite silver door at its entrance, built by Raja Shamsher Singh (1850-1914); as well as the silver repousse work on its other doors and its carved windows and balconies. 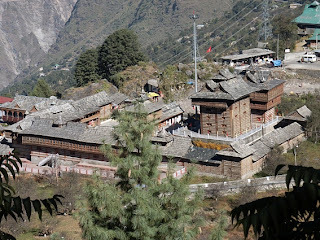 High in the Himalayas, above the district headquarter Recong Peo, sits the small town of Kalpa. 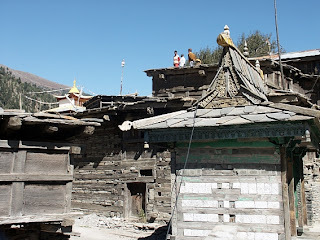 Populated by the Kinnauri people, this village is not only hard to get it, but beautiful and heavenly to visit between the months of May and October. 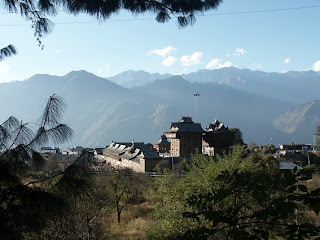 It is located at a height of 2960 m. Kalpa is surrounded by picturesque villages and was once the favourite haunt of Lord Dalhousie, the then Governor General of India. 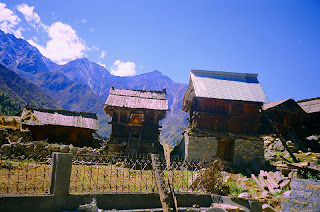 The local inhabitants follow a syncretism of Hinduism and Buddhism, and temples in Kalpa are dedicated to both the faiths. 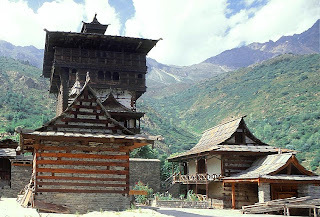 Kalpa is a town of with history of ancient temples. 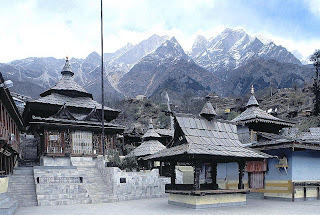 Kinnaur’s most powerful local deity is Chandika Devi, whose temple is located at Kothi near Kalpa. 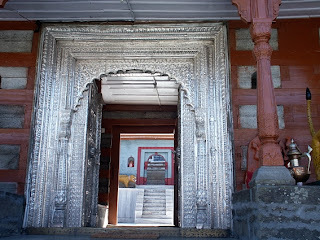 The temple popularly called Devi Kothi has beautiful wood carvings and silver plated doors. The devi is depicted as a rich golden image vanquishing a demon. According to a legend, Chandika was the eldest of Banasur’s 18 children. 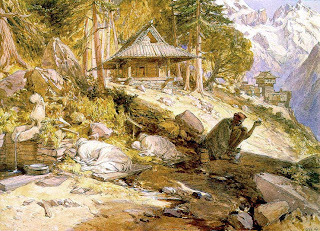 She was given the responsibility of distributing Kinnaur among her siblings, and kept Kothi for herself. However, to rule Kothi, she had to defeat the demon that supported the region’s Thakurs. She managed to trick and decapitate the demon, but unfortunately it had the power to grow back its head indefinitely. It was only upon asking her brother, Chagaon Maheswar, that Chandika realised she had to smash a small life-giving beetle that fluttered near the demon at all times. Chandika deity is worshipped like many other Kinnaur deities, in a quite unique way: four devotees swing her in a dance on her palanquin. 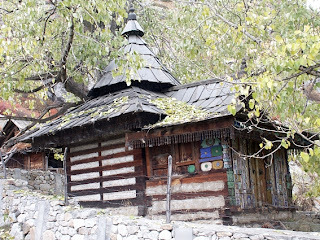 Most of Kinnaur’s temples have separate enclosures for bhoots or demons. 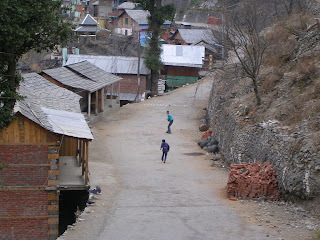 In fact in Kinnaur there are bhoots for every occasion: Bakhar Shuna haunts forests, Banshir can assume the form of giants, Ruksas are spirits of sinful persons, while Khunch live in houses, and can pass from family to family through exchange like marriage. 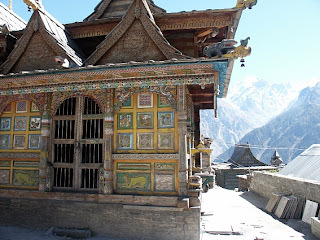 The temple of Nag Devta somewhat weathered, yet colourful and delicately painted is another beautiful temple near Kalpa at Pagi. 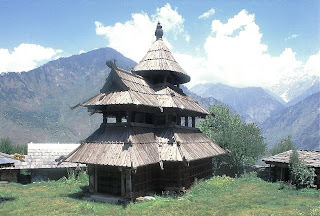 The Vishnu temple of Chini, Kalpa town is another wooden landmark of Kinnaur. 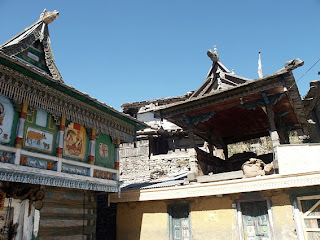 The temple compound has two buildings, both made of wood and with gabled roofs. 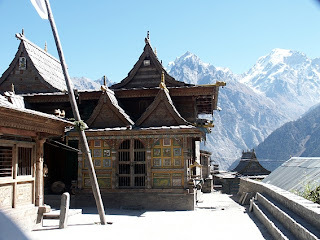 Chitkul is the last village on India China boarder in Kinnaur, located at a height of 3,500 metre in the Baspa valley and has three temples dedicated to Mathi Devi, the oldest which is said to be about 500 years old. According to a local legend, the Devi undertook a long and arduous journey before settled in this village. She visited several villages presided over by the members of her family. Lord Badirnath of Kamru is her husband. Nag of Sangla and Shamshares of Rakhcham are her nephews. When Mathi Devi finally settled in Chitkul, the village found a great prosperity and she continues to be worshipped with great fanfare. The other well-known monument of this area is the five storey fort at Kamru, which is impressive, located high on the hill just outside the village and constructed of stone and wood. Kamru was the capital of Bushahar, before it was shifted to Sarahan. The strikingly attractive three storied pagoda shrine, the Maheswara temple of Sungra often remind the visitors about the Middle Age churches of northern Europe. 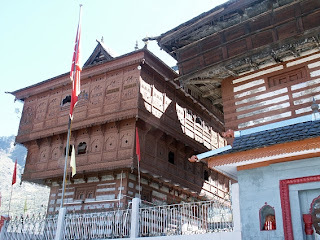 Indeed, the main wooden temple has a tiny sikhara like shrine facing it, on a square stone platform. It has been dated to the 8th century. The temple newly renovated, has wonderful carvings, including a series of Vishnu incarnations, and even the Hindu astrological signs.